Oxford University Press, USA, 9780195335347, 250pp. America's leaders say the economy is strong and getting stronger. But the safety net that once protected us is fast unraveling. With retirement plans in growing jeopardy while health coverage erodes, more and more economic risk is shifting from government and business onto the fragile shoulders of the American family. 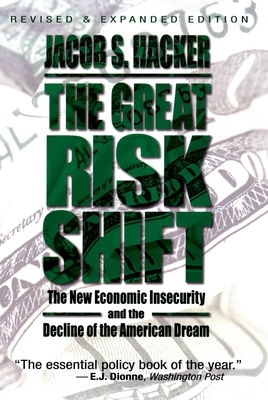 In The Great Risk Shift, Jacob S. Hacker lays bare this unsettling new economic climate, showing how it has come about, what it is doing to our families, and how we can fight back. Behind this shift, he contends, is the Personal Responsibility Crusade, eagerly embraced by corporate leaders and Republican politicians who speak of a nirvana of economic empowerment, an "ownership society" in which Americans are free to choose. But as Hacker reveals, the result has been quite different: a harsh new world of economic insecurity, in which far too many Americans are free to lose. The book documents how two great pillars of economic security--the family and the workplace--guarantee far less financial stability than they once did. The final leg of economic support--the public and private benefits that workers and families get when economic disaster strikes--has dangerously eroded as political leaders and corporations increasingly cut back protections of our health care, our income security, and our retirement pensions. Blending powerful human stories, big-picture analysis, and compelling ideas for reform, this remarkable volume will hit a nerve, serving as a rallying point in the vital struggle for economic security in an increasingly uncertain world.